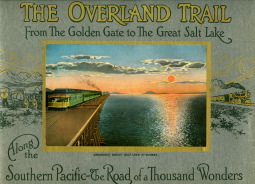 The Overland Trail: From The Golden Gate to The Great Salt Lake, Along the Southern Pacific Railroad. 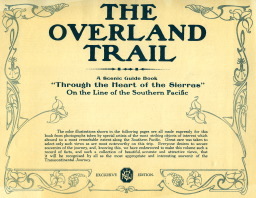 THE OVERLAND TRAIL A Scenic Guide Book "Through the Heart of the Sierras"
On the Line of the Southern Pacific The color illustrations shown in the following pages are all made expressly for this book from photographs taken by special artists of the most striking objects of interest which abound to a most remarkable extent along the Southern Pacific. Great care was taken to select only such views as are most noteworthy on this trip. 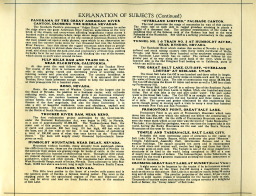 Everyone desires to secure souvenirs of the journey, and, knowing this, we have endeavored to make this volume such a record of facts, and such a collection of beautiful, accurate and attractive views, that it will be recognized by all as the most appropriate and interesting souvenir of the Transcontinental Journey. 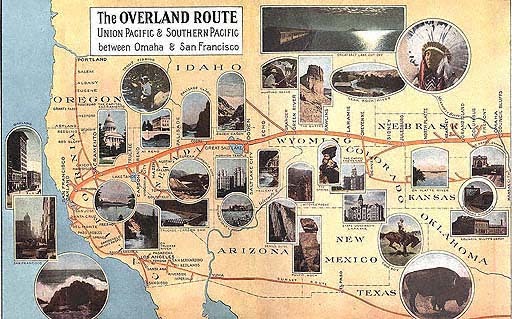 A trip thru the Sierras via the Overland Trail of the Southern Pacific cannot help but linger in the mind of the traveler as one of the most attractive and instructive of his journeys in Far West sight-seeing. Traversing, as it does, the western slope of the Sierra Nevada Mountains, the way is marked by the great profusion of vegetation that this section of California is famed for. 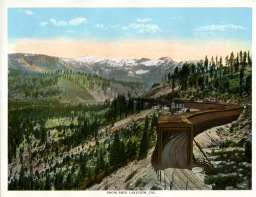 The summit of the range is crossed thru a natural pass made by the Canyon of the Truckee River—a wild gorge carved slowly in the course of centuries by the waters flowing out of Lake Tahoe. On the Eastern slope, the great walls of rock plunging sharply down into the plains below show by the absence of the heavy forests so plentiful on the other slope, the effects of the dry air and lighter rainfall. The wider vistas of country extending for miles towards mountain peaks of peculiar formation have an attractiveness that is fascinating. The historical days of the Forty-niner and the Far West are brought vividly to mind as for miles the train keeps close to the old Emigrant trail. The rock ballasted steel-ribbed road to-day is strikingly contrasted with the long thin dusty trail of forty-five years ago that connected California with the far eastern centers. Nor can the traveler hardly realize that for miles he is rolling over a region which was once the bottom of a great inland sea, known to geologists as "Lake Bonneville," that sunk ages ago into the comparatively small proportions of the present great Salt Lake. 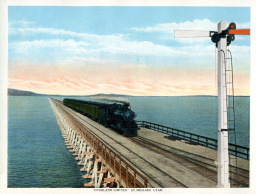 The charm of this lonely lake and the colossal engineering feat of thrusting a line of steel across its waters leaves an impression on the traveler that is to be reckoned with in times to come as his mind wanders back and reflects on his trans-continental journey along this road, which has been so aptly named, "The Road of a Thousand Wonders." SAN FRANCISCO. San Francisco is the largest and best known of the cities on the Pacific Coast. 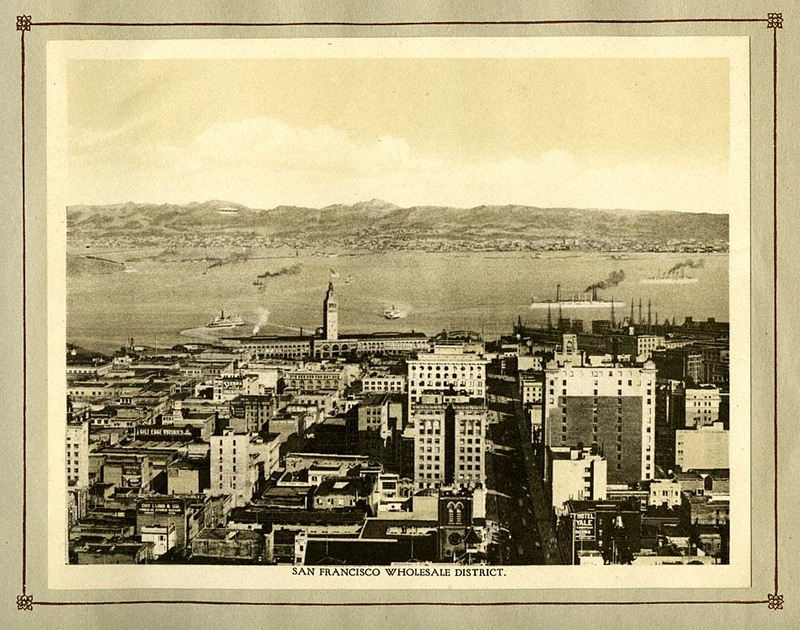 This bird's-eye view of lower San Francisco, the Ferry Building and San Francisco Bay, shows the splendid body of water facing the city. The bay is seventy miles long, and from three to ten miles wide, and has an area of four hundred and fifty square miles. Vessels of all descriptions, and from all parts of the globe, populate San Francisco harbor, which is the pride and marvel of all navigators. Yerba Buena Island is seen on the left, the trans-bay cities of Oakland, Berkeley and Alameda and ferry boat landings in the middle distance, while in the distance Mount Diablo. H. R. TIMM DAIRY. DIXON. CAL. In the Sacramento Valley is a wide expanse of rich farming country, devoted to growing Alfalfa, Fruit and Nuts. and in these low-lands also are many green dairy pastures. 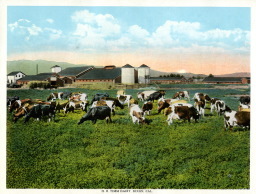 Here we see a model dairy at Dixon, California, which furnishes much of the cream and milk for San Francisco, and its sister cities of Oakland, Alameda and Berkeley. CALIFORNIA STATE CAPITOL. SACRAMENTO. 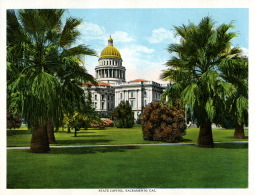 The State Capitol was permanently located at Sacramento, February 25, 1854, and in 1869 the present building was completed at a cost of about $3,000,000. The building is set in a park of ever blooming rare and semi-tropical trees and flowers. ORANGE GROVE. NEAR COLFAX, CAL. To the first-time visitor to California the "Ogden Route" more completely than any other, fulfills expectation by its rapid and sudden transition from snow-capped peaks, timbered heights and rugged canyons to foothills checkered with orchards and vine-yards, gardens with flowers abloom and homes surrounded by fertile valley lands. 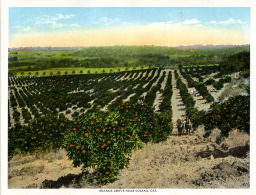 We here see an orange orchard near Colfax, California, in the foot-hills of the Sierra. HYDRAULIC MINING AT DUTCH FLAT. To one familiar with the history of "49," the name of Dutch Flat calls to mind the stirring times of the gold rush to California. Here can be seen the scarred hillsides where hydraulic power swept gold from the rich gravel. There is still plenty of gold here, but the needs of the agriculturists have prohibited hydraulic mining although the stages still run from Dutch Flat to "You Bet" and "Little York," where mines are still working. TRAIN ARRIVING AT AMERICAN, CAL. Observation Terrace overlooking the American River Canyon in the High Sierras, at American Station, on the western slope of the Sierra Nevadas, an observation tower has been constructed overlooking the gorge of the Great Canyon American River, which swirls and foams 2,000 feet below. Through Southern Pacific trains stop at American for 5 minutes to enable passengers to alight and enjoy the magnificent scene. SNOW SHEDS IN THE SIERRA NEVADA MOUNTAINS. 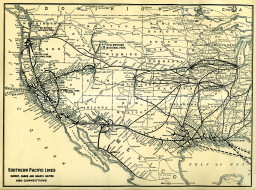 In order to protect the traveler from delays in inclement weather, the railroad company has constructed an almost uninterrupted line of snow sheds for forty miles. These snow sheds make travel practical even in the worst winter weather, and through the loopholes cut in the sides, the traveler catches tantalizing glimpses of magnificent scenery. DONNER LAKE. 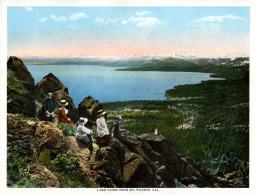 Between Summit, the highest point on the trip across the "Divide," and Truckee, the traveler looks down to where Donner Lake gleams in its granite basin. The lake is about three miles long, half as wide, and some two hundred and fifty feet deep. There is good fishing, and there are hotel accommodations. It is easily reached from Truckee, being only three miles away, over a good road. 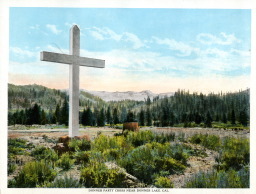 DONNER PARTY CROSS AT DONNER LAKE. 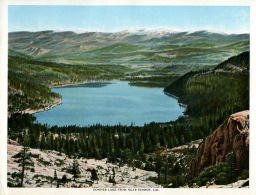 A melancholy interest is attached to Donner Lake by remembrance of the terrible fate of the Donner Party, thirty-four of whom perished of starvation on its shores. A cross has been erected in memory of the tragedy. LAKE TAHOE. Set in the midst of the Sierra Nevada Mountains, among which are a dozen snow-capped peaks. Lake Tahoe, declared by all to be the peer of all mountain lakes, reflects a picture to be seen nowhere else in the world. The great depths of the lake account for its wonderful color of water, which is the first thing noticed by visitors. In some places its depth is unknown. Its length is twenty-three miles, its maximum width thirteen Its altitude is 6,225 feet above sea level. On its lovely shores are to be found many delightful summer resorts. The midsummer air is cool and invigorating, the hunting and fishing excellent, and the landscape picturesque and a never-ending delight to the eye. PANORAMA OF THE GREAT AMERICAN RIVER CANYON, CROSSING THE SIERRA NEVADAS. 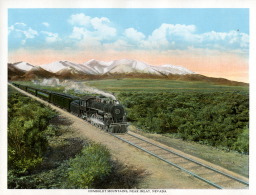 The Southern Pacific's picturesque "Odgen Route" traverses for miles the ridge above the great American River Canyon, sometimes at the very brink of the chasm, and everywhere affording magnificent vistas across a hundred miles of mountains, where range above range reach off into purple distance. But the culmination of the trip comes at American Station, where the train passes out upon a rocky plateau. 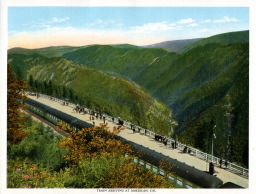 upon which is an observation terrace and the traveler looks down for two thousand feet into the American River Canyon. Into this abyss the rugged mountain sides slope at precipitous angles, sinking in almost sheer descent. The Sierras rise like a wall beyond, and ahead looms the dark pine-clad promontory of Giant Gap, pushing its bulky form far out into the canyon and blocking the way of the stream, which swirls in swift water around its base. 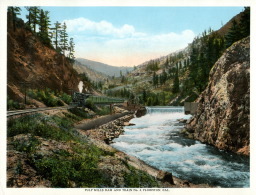 PULP MILLS DAM AND TRAIN NO. 4, NEAR FLORISTON, CALIFORNIA. At this point the road follows the course of the Truckee River The course of the river is tortuous, and quick changes are made from side to side, giving, varied and interesting views of towering rocks, foaming waters and pine-clad mountains. 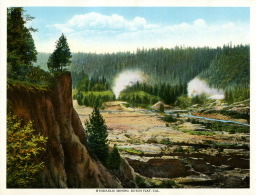 The country hereabout is given over very largely to lumber industry It is estimated that the Truckee, River basin possesses enough timber to keep the sawmills going at their present rate for a hundred years. 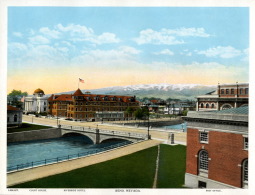 RENO, NEVADA. Reno, the county seat of Washoe County, is the largest city in the State of Nevada. Its position as a business center, with railroads radiating north, east, south, and west gives it an enormous tributary territory. Here are modern business blocks, department stores, excellent hotels, fine public buildings, schools, churches, libraries, a fine theatre of the first magnitude, and also the State University. It is also a city of beautiful residences, trees and shrubbery, asphalt and macadam streets. The city is named after General Reno, who lost his life in the Battle of South Mountain. TRUCKEE RIVER DAM, NEAR RENO. 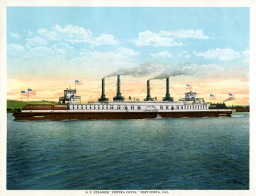 The first reclamation project undertaken by the Government, under the National Reclamation Act, was begun in 1903. in Nevada, at a cost of approximately $7,000,000. 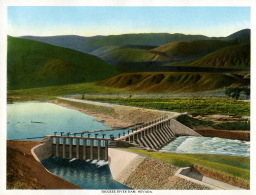 The Truckee-Carson Dam, the main unit of this project, was completed in 1913. The dam is built of earth and concrete, 800 feet long, 110 feet high, 400 feet wide at the base, and 20 feet wide at the top. It was the "means of reclaiming a total of 200,000 acres of what was once known as the "Forty-Mile Desert." The dam will supply many thousand hydro-electric horsepower as well. HUMBOLDT MOUNTAINS. NEAR IMLAY, NEVADA. Mountains without foothills, rising abruptly from sagebrush plains, like cliffs from the sea, these are the characteristic mountains of Nevada In the summer their slopes are grazing range for herds of cattle, in the winter they are beautiful in mantles of shimmering snow. Throughout their extent are mineral deposits of immense value; they are rich in gold, silver, lead, quicksilver, copper and other metals. The mountains here shown are the West Humboldt Range, south of Imlay, Nevada. They culminate in lofty Star Peak, 10,000 feet above sea-level, long in sight from Southern Pacific Trains. 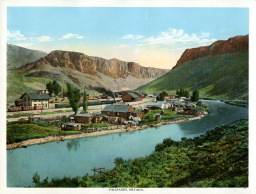 PALISADE, NEVADA. This little town nestles in the heart of a twelve mile canon and is the junction point of Eureka, a famous mining center. The town is the shipping point for the agricultural regions of Pine and Diamond valley and for silver and lead ore from Eureka en route to the smelters at Salt Lake. 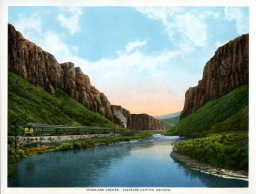 "OVERLAND LIMITED," PALISADE CANYON. The road penetrates the range of mountains by way of this canyon. The walls rise on each side in rugged grandeur attaining in places a height of a thousand feet. The peculiar stratification of the rocks re¬ sembling that of the famous rock of the Hudson has lead to the term Palisades of the Humboldt. Red Cliff is a striking promontory in the midst of the Canon. TUNNEL NO. 1 AND TRAIN NO. 3 AT HUMBOLDT RIVER, NEAR. RYNDON, NEVADA. The Humboldt River which makes this section of Nevada a fine agricultural and stock raising country rises thirty miles northwest of Wells, Nevada, and flows nearly three hundred miles southwest emptying into the Humboldt Lake which has no outlet. 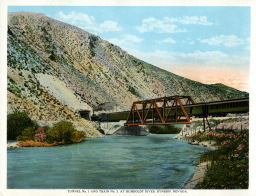 The railroad follows for the greater part of its way along the north bank of the river, while on the opposite side is the Old Emigrant Trail leading on to California, parts of which can still be seen. PROMONTORY POINT, GREAT SALT LAKE. 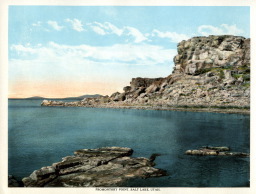 Promontory Point is an arm of Promontory Mountain which runs down into the lake, over which the railroad ran before the construction of Great Salt Lake Cut-Off. On the cliffs of Promontory Mountain can still be seen the water mark which at one time was the level of "Lake Bonneville." This lake, it is claimed by geologists, was at one time the largest lake in the world, having the Rocky Mountains on the east and the Sierra Nevada Mountains on the west for its rims. 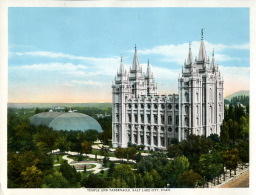 TEMPLE AND TABERNACLE, SALT LAKE, CITY. Probably the most interesting point of attraction to the visitor in Salt Lake City is Temple Square, which embraces the great "Mormon" Temple, Tabernacle, Assembly Hall, Information Bureau and a few smaller buildings. The square occupies ten acres and is encompassed by a solid stone and cement wall, twelve feet high and three feet thick, with large gates on each side. The Temple is one of the most magnificent structures of its kind in the world, being completed in 1893 at a cost of nearly four millions of dollars. The famous Organ, in the Tabernacle, is conceded by the world's greatest musicians as being the finest instrument of its kind in America. CROSSING GREAT SALT LAKE, AT SUNSET (Cover View.) A sight never to be forgotten by the tourist if he be fortunate enough to cross Salt Lake on the Great Cut-Off during a magnificent sunset, such as shown in this picture. Salt Lake is a miniature ocean, being 90 miles long and 40 miles wide. The peculiar properties of the water, 22 per cent of which is solid matter, makes it impossible for the human body to sink. Thousands of tourists enjoy each summer the unique novelty of a delightful bath at Saltair, the "Coney Island" of Salt Lake.